Today is 7th March 2013, next Monday is 11th and the second anniversary of the 9.0 magnitude Great East Japan Earthquake and Tsunami. Last month (Feb 2013) I was fortunate enough to attend a farewell function for Kogota Nourin (Agriculture and Forestry) High School (小牛田農林高等学校). 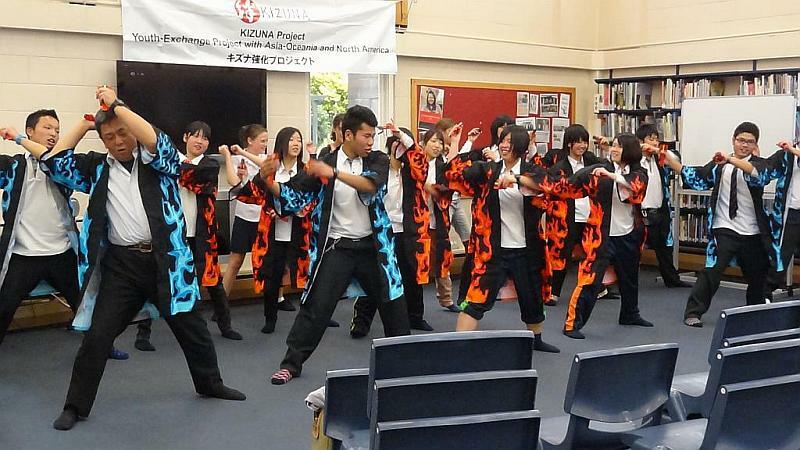 A group of their students came on an exchange programme to Kaiapoi School, Christchurch through the Kizuna Project キズナプロジェクト http://sv2.jice.org/kizuna/e/. This is where it gets a little complicated so hopefully I have it right…! The Kizuna (bond) Project is a Youth-Exchange Project with Asia-Oceania and North America. It was set up by the Government of Japan in April 2012 and is administered through the Ministry of Foreign Affairs – http://www.mofa.go.jp/j_info/visit/incidents/kizuna_project.html. One of the implementing organisations is the Japan International Co-operation Center 財団法人日本国際協力センター http://sv2.jice.org/e/. The aims of the Kizuna Project is to promote global understanding of Japan’s revival efforts in response to the Great East Japan Earthquake. Under this project, youths from 41 countries and region will have an opportunity to participate in the related programmes. Coming from inland Miyagi Prefecture north of Sendai, the Kogota area escaped the damage experienced along the coast. During their presentation the students said they did volunteer work in the tsunami area but were now short of funds. This was perfect for what I wanted so at the end offered what I collected to their teacher Watanabe Sensei. A quick trip home to get it was followed by a ride out to the airport hotel where they were staying for their last night in Christchurch. See http://kogotanourin.myswan.ne.jp/home/information/2013-02_new_zealand_2013.pdf has a story about their stay in Christchurch, (only in Japanese though). Kogota Nourin High School students performing Yosakoi dance at Kaiapoi. Giving most of what I collected to Watanabe Sensei. 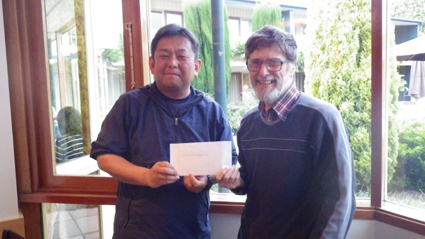 The photo above is at the airport hotel giving most of what I collected to Watanabe Sensei. I am very happy to have found someone to give it to after all this time! There is a bit more left and I may have found another organisation. This entry was posted in Kogota, Miyagi, Sendai, Tohoku. Bookmark the permalink.